I’m taking a quick break from family time to wish you a Joyful, Healthy, Peaceful Prosperous New Year. The Night Crown Heron seems to be pondering? Reflecting? Have you taken the time to reflect and acknowledge your accomplishments in 2010? Will you to be stepping lightly into 2010 or taking a leap? And, in celebration of both the “good” and the “bad” in the year almost over, as we look forward to the upcoming year, I include one of my favorite photos taken a few years ago. With the spontaneity and freedom of youth, my grandson and granddaughter, along with their cousins from Indiana, are dancing and singing, celebrating the rising sun. I use it here to acknowledge the past year and welcome the upcoming one. For me, in addition to the light, the photo also exudes warmth. So, I offer it to you now, wishing you light and warmth, wherever you are, during this season. And, should it be a challenging time for you, I invite you to pause, close your eyes and do some deep breathing. I invite you to take a moment or two, or more, to reflect. Where in your life is there light and warmth? Who are the people past and present who have contributed that to you? Is there a way for you to express your gratitude? Do remember to acknowledge yourself. In the gratitude there is light. This past year I spent a lot of time in search of my purpose/my identity. Not that this was anything new. What was different this year was the number of places I went and the “new” people with whom I interacted. I thank them all for their contribution and continuing support and belief in me. They/you know who they/you are. The transformational difference for me is that by the end of the year, I finally clearly saw how dependent I’ve been in terms of defining myself as others see me and then attempting to fit into what I think that is. The result for me has been that, in trying to “fit” their image, I was not fully and comfortably “fitting” into myself. One of the prime examples in this past year has been in the promotion of my Through and From the Lens/Point and Shoot Photo Course. It is a core course I’ve developed that has made a remarkable difference for participants AND I’ve been relying on others to point me in the direction of the “best” web page, marketing, and more. Please check the link out. I would love to be connecting with you on a more direct level, furthering what we see in Picture to Ponder. I feel blessed to have you in my life. Thank you for being there. May you have a very Happy, Healthy and Prosperous 2010. With this issue of Picture to Ponder, I wish Happy Holidays to those who still have celebrations up coming. I would expect you, like I, have a long to-do list and may also be inundated with the wide range of emails offering holiday and year-end specials. I am thus being VERY BRIEF. Yesterday I was working on the bonus gift I’m preparing for Allison Maslin’s BLAST OFF book launch in January. It’s a REFLECTIONS PDF slide show with Queries from Picture to Ponder. One photo I’ve included is below, that of reeds reflecting sunlight in Wakodahatchee Wetlands. It popped out at me when I was selecting photos for the bonus and again today. To me, in addition to the light, it’s also exuding warmth. So, I offer it to you now, wishing you light and warmth, wherever you are, during this season. Should it be a challenging time for you, I invite you to pause, close your eyes and do some deep breathing. Where in your life is there light and warmth? Who are the people past and present who have contributed that to you? Is there a way for you to express your gratitude? Stories and Limiting Beliefs – Rain Drops and Wood Knots – Picture to Ponder v5-46. Earlier this week, when I put together the mailing on Nature Art Gifts, I stated that I would follow up with the story on ease and synchronicity. It’s really a simple story. Yet the “weight” of writing “the right thing,” and the other “stories” I’ve been creating during this week, have resulted in a huge delay. I am now sending this issue of Picture to Ponder out now, simply because I said I would. First story – Once I decided to create the one-stop-shopping page, I needed a header with an expressive picture. I went to the folder that has the almost 1,500 plus photos used in Picture to Ponder during the past five years and the Feral Parrot, featured 3 1/2 years ago, seemed to open itself out of nowhere. He seemed to be representing inquiry and appreciation. So I went with the photo, extending the background to fill the desired space for the banner. Next, I decide I wanted to use a different font and I clicked on the first one that caught my eye. Never used by me before, it was perfect! The bottom line – a simple story of what can happen when we let go of needing to know how something is going to look. Further “stories” that occupied my week revolved in large part around my 70th birthday being on Thursday. I had been making the number mean, I am “old” despite my looking younger and feeling a lot younger than my internal, past-based conversations of what “70” is/would be. Then because I was open, as a result of the morning walk discussed below, I could hear who I am reflected by coach Sue Stebbins in a teleclass call yesterday. I was able to accept and start owning that my experience, creativity and youthfulness are all strengths with which I can position myself. Also, underlying my earlier expectations of what my day was going to be like was the fact that Sam is no longer here to celebrate this milestone. I was certain I was going to be “tearing-up” throughout the day. When I woke up in the morning, I decided a shift in routine might help; so I went a morning walk at Wakodahatchee Wetlands. Today’s Photos constitute the story of the walk that did result in a dramatic energy shift, setting up a great celebratory day. Shortly into my walk at Wakodahatchee, I noticed remnants of raindrops hanging down from the boardwalk railing. “Oh, my tears,” thought I. So I pulled the camera out of my bag and started photographing. Further along my walk it started drizzling and the camera went back into the bag. Once under a covered area on the boardwalk I got under my umbrella, took the camera out and used the movie setting to record the “tears” creating ripples in the water. Listen closely and you can hear the sounds of birds. It stopped raining and I continued my walk, going right passed something that caught my eye on one of the boards underneath. Then I heard my inner voice, “Stop. Go back. Whenever something catches their eyes, you teach people to pause and photograph it.” So the camera came out again and I turned around. I took several photos along the board, getting particularly excited with the one above that looks like a soaring bird with neck stuck way out. Going to the other side of the plank, the same image now looks like a snake coming at me. Or, perhaps it’s a turtle swimming toward us. Yesterday’s photographing ended with my pointing out the images in the wood knots to a passing couple. They immediately saw what I saw and more and proceeded to tell me that there is a “lion” that can’t me missed on the boardwalk in a section of Green Cay Wetlands. I was assured that it is quite obvious. Though I’ve walked at Green Cay countless times, I have not seen the lion. It’s now on my list to seek out, once the weather clears. I am grateful that I live so close to these wonderful Nature walks and in the weather to enjoy them year round. I am also grateful to my family and friends. Having set it up with my walk to be such, it turned out to be a great day of celebrating going into my 8th decade!! Today’s issue is really a demonstration of “limiting beliefs” and choices that can be made to stay in negative spaces or create shifts beyond. As you know, I use my camera and encourage you to do the same. If you have not seen, or read it for a while, you can find “7 Tips for Getting Out of a Funk” on eZine Articles. I invite you to find, and make note of, the tools you use to get unstuck. Are there situations now around which you are “spinning” negative stories? Things you are reluctant to do? Or face? If so, I invite you to find the actions that will create shifts for you. Holidays are very difficult for many of us. Should you be in that situation, I wish you an easy, happy way to make a change in that state for you. As always, have fun with this. Stories can be lots of fun, especially when we create happy endings. In a comment to yesterday’s Picture to Ponder posted here on Photography and Transformation (scroll down one post), Barbara said she could not see the cat that I said I had seen in the cut trunk. It’s five years later and I, of course, don’t remember exactly what I saw then. I looking for it now, I am assuming I saw it as I’ve outlined below. The black “hobo” is irrelevant in this view. Many more “whiskers” are in the whispy grey at the bottom. How about you? Do you see anything totally different from the hobo and the cat? REMINDER _ I will be interviewed on Blog Talk Radio by Amethyst Wyldfyre this Friday, December 11th at 4 PM Eastern US time. Amethyst has entitled the program “The Gifted Hand, The Gifted Eye – Fine Arts for the Holidays: Interview with Sheila Finkelstein” I’d love for you to join us. Please bookmark SHOW. You can listen on the web, call in and/or download the call after the show, if the time does not work for you. My other big news is that today we are celebrating the 5th anniversary of Picture to Ponder, which was launched on December 9, 2004. I did a count the other day and saw that today marks the 476th issue. Starting out with simply a photo, discussed in the next issue, four times a week, we shifted eventually to the current one issue per week with both photos and self-reflecting queries. The latter evolved and became “official” after about six months. It is my desire to inspire you to discover and expand your own greatness of seeing, imagining and/or creating. From comments I’ve gotten over the years I think I am fulfilling on this. the remains of a tree damaged by the Florida hurricane, then cut. Since that time, I recall this as the “Hobo Photo.” I’d even forgotten the “cat.” As I look at it now, I think the cat part appears when we disregard the black portion and look at the whole space surrounding it. As most of you know, Sam is no longer here to share interpretations with me, so for the most part the added dimension comes when you add your experience or interpretations on the blog. I had seen a stumpy man with a green cap and sunglasses, so I zoomed in. I thought I would use it here and simply label it as “Unidentified Object”, after sharing my interpretation. I really had no idea of what I was looking at. Fortunately, for my curious mind, I shared this with the couple mentioned above. How delighted I was that I did. “It’s a turtle,” one said. I looked at it and, of course, it became quite obvious once it was pointed out. As a matter of fact, all they had to do was say “turtle” and I saw it immediately. The “sunglasses” were part of the turtle’s body, the “nose”, his head. The “green cap” was duckweed on the turtle’s shell. None of us, though, could determine what it was sitting on, so we decided to leave it labeled as an imaginary wolf. Ever curious, I did go back a little earlier the next day for a clearer view. With the duckweed in the water having moved on also, it became quite obvious that it was a log, now looking more like a resting dog. A close up brings our attention more to the full experience of both the “face” and its reflection, and there might be yet another interpretation. I’ll leave that one to you. If you have an interpretation to share, please post it below. As an aside, if you are interested in surfing through some of the issues over the years you can check the eZezine Archives for issues from Issue 4 up through October 2008. Please tell anyone you might share this with NOT use the subscribe button on the eZezine archive pages. We are now at aWeber and you can see the archives from October 2008 to now at aWeber PTP Archives. I also have all of the issues on eteletours.com. Starting with Issue 1 – http://www.eteletours.com/issue1.html you can scroll through all of the issues by using the arrows at the bottom of each issue or by changing the number in the URL. I started out stating that today’s issue is a celebration. I’m certainly not “jumping up and down”… the image that the word “celebrate” pulls up for me… and I am acknowledging the pleasure, satisfaction and feeling of accomplishment at ongoingly fulfilling on a mission declared five years ago. What is your view of “celebration” and how do you celebrate yourself? I invite you to find one or more things for which you would like to acknowledge yourself. Certainly feel welcomed to post them on the blog. Also, the main theme of the photos revolves around “interpretations” and expanding ourselves when we are open to others’ interpretations and points of view. I invite you to find something that may be intriguing you… a visual image, or a happening… and get in conversation with another about it. Before sharing your interpretation(s), invite them to share theirs. Is it different? the same? and/or do new possibilities open up for you? You might even use today’s photos as the ones to open up dialogue. If you do, please post your experience on the blog. As always, have fun with this. Also, if you would like to experience the expansion of your own discovering and sharing of interpretations in the upcoming Telecourse for which I am in the process of setting up dates, you can put yourself on the “Be-Informed” list form at the bottom of the page on Point and Shoot Photo Courses. One of the things I have neglected to share here is that a few months ago I took the bold step of having professionally scanned several of my Fantasy Landscape water color series to make them available as giclee prints. Notecards of four of the images will also be available, for sale and holiday gift giving, by tomorrow. Now to Today’s Photos – I mentioned last week that I had recently been attracted to window reflections and mentally was planning a whole “lesson” in seeing – expectations – and shifts. On Sunday, after a weekend art show, I glanced across the park into windows above a shop and was captivated by the reflections. I won’t know until I start writing here today, what the “lessons”, if any, will be. Let’s simply start with the photographs. In this first photo, I was on an early afternoon conference call sitting at one end of my patio. When I looked across, to the left of my kitchen doors, I became intrigued by what appeared to be an extension of my house on the “outside”, as well as the wavy images in the door, seen on the left. I did, of course, after the call, take more close-up photos of the patterned reflections, then went outside to double check that, in fact, my house does end with the glass windows, no other extensions. I include the full-view photo here to simply give a sense of the scene and its possibilities. The next two photographs are among those which I took of assorted reflections in the upper story windows across from the park last weekend. Outside, inside, does it matter which? Which, if any, have more appeal? For me, the most artistic of the three is the center photo – flowing shapes in the reflections, with faint, straight, diagonal lines. All are anchored by the bold lines of the window frame. The main point of these reflections photographs, is to invite you to also look at reflections that might be showing up in windows through which you frequently look. If you do not immediately see anything reflected, change your position. And, whether you do or don’t see reflections the first time, I invite you to also check the same windows a few times during the same day and evening. You will probably be surprised to note that you may be seeing reflections and images that are quite different each time you look. If you start noticing anything new or different in this way, I invite you to look at one or more situations, or relationships, in your life. Does it, do they, change when you move, shift perspectives, alter the time of day or night, when you are studying it/them? In the above photos, there are many dimensions which we could spend a lot of time attempting to figure out what belongs where. What is actually being reflected? Which of the images are reflections? Which are actually there in the exact position in which we see them? We can ask ourselves all these questions, find the answers, and then what? Is is sometimes sufficient to simply enjoy and be with what is? Might the enjoyment be even greater at times if we remain in a state of appreciation, rather than dissection? What comes up for me is to remind myself, as much as I love inquiry and discovery, that I often have peaceful times when I allow myself to simply be and appreciate. How about you? As always, have fun with this. Have you asked anyone lately how they perceive you? If not, I invite you to do so. I often experience a greater sense of myself when I see myself reflected in another’s words. You might be pleasantly surprised. Why not treat yourself and another the opportunity to “gift” you their vision of you. A recent example for me, relates to the upcoming radio show mentioned earlier and Amethyst Wyldfyre’s description of me, on her main Blog Talk Radio page. Under upcoming interviews, she refers to me as a “prolific photographer and brilliant artist” who “…is also an inspiring teacher and has brought many of her students to the gifts of creative self expression.” Thank you, Amethyst. Do please bookmark the site and join us. If the time does not work for you, you will be able to download the call at a later time. I also invite you to check out some of what Amethyst is up to with her work with Energy Mastery for the Evolving Entrepreneur on her Energy Journey.com site. You can also learn more about her and her shamanic work and Crystal Bowl Sound Healing on AmethystWyldfyre.com. 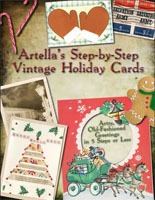 A F*R*EE copy of the Artella eBook, Artella’s Step-by-Step Vintage Holiday Cards, an eBook featuring 10 beautiful handmade cards, complete with photos and descriptive “how-to” instructions, showcasing a variety of techniques such as rubber stamping, collage, and innovative paper and mixed media arts. For year-round creative ideas and activities, check out the 55% off savings on Holiday Gift Memberships on Artella’s Creativity (virtual) Cruise Ship. And, if you are a coach, or want some creative ideas for art activities geared toward transformation and growth, check out “Creativity, Intuition, and Choice” in ARTbundance Coach Training Sample Class on Tuesday night December 8th.